"Great summer pie and delicious with vanilla ice cream." Whisk 2 1/2 cups of flour and salt together in a large bowl. With a pastry cutter, chop the vegetable shortening and unsalted butter into the flour until the mixture resembles coarse crumbs with a few pea-sized pieces of fat; stir in ice water, 1 tablespoon at a time, just until the mixture holds together when squeezed. Divide dough in half, and form each half into a ball; wrap the balls in plastic wrap, and refrigerate at least 1 hour or up to overnight. Preheat oven to 375 degrees F (190 degrees C). Roll out a dough ball on a floured surface into an 11-inch circle; fit the crust into a 9-inch pie dish. Refrigerate while making filling. Mix strawberries, rhubarb, 1 1/4 cup of sugar, tapioca, 2 tablespoons of flour, vanilla extract, orange juice, orange zest, and cinnamon together in a bowl. Pour the filling into the crust-lined pie dish. Sprinkle 2 tablespoons of butter pieces over the filling. Roll the second dough ball out into a 10-inch circle on a floured surface, and gently place the top crust onto the filling. Crimp the edges together with a fork to seal. Brush the pie with beaten egg white, and cut several slits into the top crust with a sharp knife..
Bake in the preheated oven until the crust is golden brown and the filling is bubbling, 55 minutes to 1 hour. Cover the pie edges with strips of aluminum foil if they start to brown too quickly. Cool completely before serving. Best pie crust I have ever made! The only thing I changed was more berries and rhubarb since my pie plate is deep. This is my family's favorite pie now and that says a lot cause we're from the south! 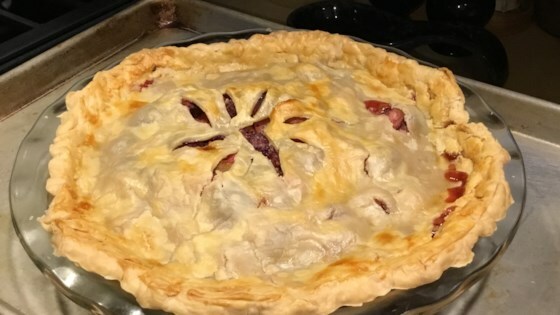 great pie recipe thank you for sharing. Delicious! Never made it before. I only used a pinch of cinnamon and skipped orange zest! Great recipe!